Climate Data Slapping Us in the Face! Yes, it has been a hard winter for most of us in North America. Drought, heavy snow, and the Polar Vortex all have contributed. Minnesota has experience the 6th coldest meteorological winter on record and Wisconsin the 5th coldest. Yet Alaska, and most of the earth are hotter than average. 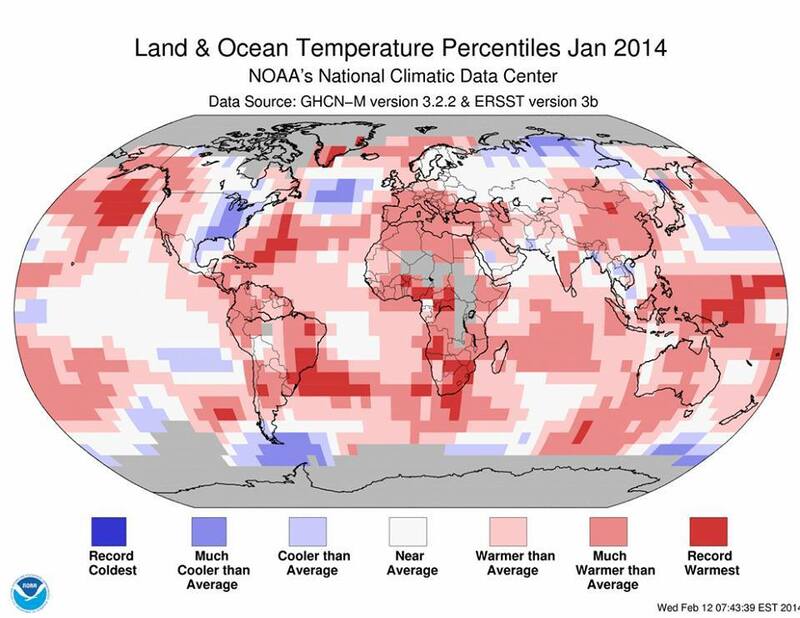 Globally it has been the 8th warmest winter! See map below. A few weeks ago I heard Mark Seeley from the University of Minnesota, http://www.climate.umn.edu/ speak on climate change. Seeley says that the climate data is, “slapping us in the face” telling us the climate is changing. Several things he said were new and interesting. First, not all places are experiencing climate change to the same degree. The Southeastern part of the United States has not seen the changes we have experienced in the north. Second, there a latitude bias–The further from the equator the more evidence of change. 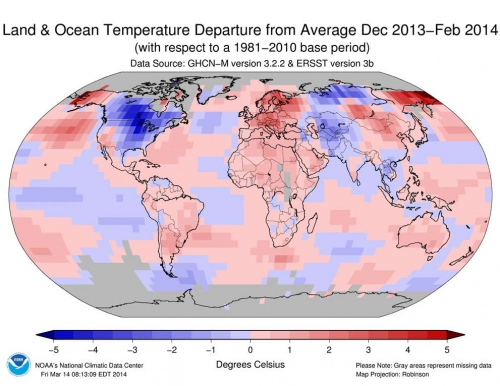 Third, there is a winter bias, winters are showing more temperature warming. Fourth, the minimum daily temperature is warming more than the high daily temperature. In other words, our night temperatures are warming! Finally, there is more moisture in the air which he says is the “ultimate greenhouse gas.” And more moisture in the air can cause more violent storms. Unfortunately, the change is happening so fast we will have to adapt quickly. We need to limit the carbon we are pumping into the air, and make preparation to prepare for the future. Previous Previous post: World Water Day, What can you do?